Carolyn Haushalter is a Founding Member of AKS and has been braiding since 2005. 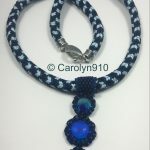 Although she studied the Japanese culture, language and history in college, she had never heard of kumihimo until well into her bead weaving and jewelry making career. She was making intricate pendants, and wanted to show them off. She ordered a kumihimo kit and was “hooked.” She uses both the disk and marudai in her work and feels they both have a lot of potential. She says, “We really have only just begun to tap into that potential.” Isn’t that the truth? Regarding inspiration, Carolyn noted, “I find myself endlessly inspired by the braid structures themselves. Every braid I learn leads me to more and more, like a puzzle. I will never tire of learning new braids.” She is also inspired by materials and thinking about how they would work together. 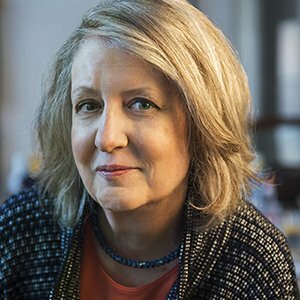 Carolyn pulls her inspiration from charts that she creates from spreadsheets. The shapes and spaces influence how she mixes repeats and structures. Carolyn is a well regarded kumihimo teacher and has been very gracious with her time teaching online classes for AKS members. Her most recent class featured her favorite braid, edo yatsu. Not only was she giving back to the kumihimo community, she said she also learned a lot by teaching the course. She especially enjoyed the great class discussions and seeing the many braids that were made. Carolyn also generously shares her knowledge of kumihimo when responding to questions on the many Kumihimo Facebook groups. 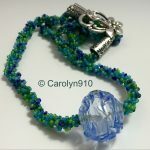 Visit her website, www.topcenter.typepad.com, to find information on threads, beads, and kumihimo topics of interest such as, kongoh gumi Z spiral vs. S spiral. 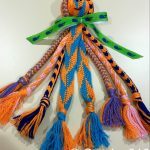 Her most popular article gives an in-depth explanation about the best cords to use with different sizes of beads to ensure a firm, round beaded kongo gumi braid.When she isn’t creating and braiding, she works in the insurance business. Carolyn lives in Ingomar, Pennsylvania.